The light has gone out, and with it that infectious warm laugh and intensely progressive commitment of the best of the Kennedys. The light has gone out, and with it that infectious warm laugh and intensely progressive commitment of the best of the Kennedys. Not, at this point, to take anything away from the memory of his siblings–Bobby, whom I also got to know, was pretty terrific in his last years–but Senator Ted Kennedy was the real deal. Unable to move with his brothers’ intellectual alacrity, sometimes plodding in impromptu expression but smooth and skillful while reading from a script, the youngest Kennedy made up for his shortcomings early in his Senate career by resolutely working the substance of issues. His principled determination, plus his capacity to truly care about the real-world outcomes of legislation for ordinary people rather than its impact on his or anyone else’s election, became his signature qualities as a lawmaker. But for those same reasons, he also wanted legislation passed, and his ability to work with the opposition, as he did three years ago with John McCain on immigration reform, now grants him a legacy as one of the nation’s great senators. Oddly enough, for one born into such immense familial expectations, he was a surprisingly accessible and down-to-earth politician in the eyes of most journalists who covered him. I think of him as always authentic and never oily. As opposed to most politicians, the offstage Ted Kennedy was the more appealing one. Although he excelled as an orator, never more so than delivering the speech that Bob Shrum crafted for him at the 1980 Democratic Convention but which was informed by Kennedy’s own deeply felt passion, it was in his less choreographed moments that he was at his best. I spent quite a few hours over the years interviewing him on subjects ranging from health care to nuclear arms control, mostly as a reporter for the Los Angeles Times, and while his grammar could be troubling, his sentiments never were. Not once in those interviews did I find Kennedy to equivocate or slide into the amoral triangulation that defines almost all successful politicians. They position themselves, but he took positions, and as in the case of health care reform, he would end his life fighting for those causes with his last breath. I would put Kennedy alongside my other hero, George McGovern, as the two most trusted standard-bearers of the Democratic Party’s too-often-sabotaged liberalism. I just could never imagine either of them ever selling us out. Indeed, I haven’t felt quite so sad about the passing of a political leader since the day when people started bawling all over the Bronx with the news that FDR had died. In a political world dominated by bipartisan cynicism, there are few touchstones of integrity for the common folk, and Kennedy was one of them. It should mean a great deal to progressives that in the race for the Democratic presidential nomination Sen. Ted Kennedy favors Sen. Barack Obama over two other colleagues he has worked with in the Senate. No one in the history of that institution has been a more consistent and effective fighter than Kennedy for an enlightened agenda, be it civil rights and liberty, gender equality, labor and immigrant justice, environmental protection, educational opportunity or opposing military adventures. Hopefully, it will be added to Ted Kennedy’s legacy that he was right about Obama, just as he was consistently right on every major issue that he dealt with as a senator. Kennedy’s endorsement of Obama was critical to our current president’s historic nomination and election, and it is therefore fitting that the favor of that all-important endorsement be returned with a significant reform of the ailing US healthcare system. 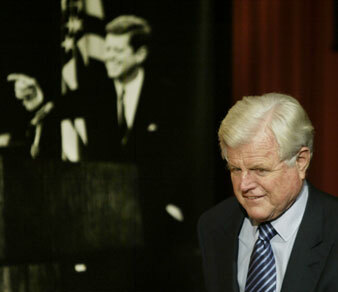 That’s also a worthy epitaph for Ted Kennedy: Born of privilege, and yet absorbed with the fate of those in need.